Nutrex Lipo 6 Black Hers is a fat burning sport supplement which is marketed to women who are looking for something from the bodybuilding and physique enhancement pool of products. Nutrex call it “beyond extreme” and have put tanned, sweat prickled women with six packs and defined muscles as the models on the advertising material. That should give you a good idea at what they are going for with Lipo 6 Black Hers. What makes it a female specific fat burner? – we’re not sure there is really such a thing, other than for a directional sales push. The only possible trend we see is that several fat burners designed for women these days contain sensory ingredients, i.e. those that improve mood, cognitive function and mental energy. Dieting , especially while exercising regularly, is tough, and those types of ingredients might be able to help people resist junk food and keep soldiering on. We recommend LeanBean – the fat burner exclusively produced for women. In a nutshell, Nutrex Lipo 6 Black Hers is a little too much in the stimulant department, and can cause a few headaches and energy crashes, but you can reduce the dose due to the 3 capsule serving and tailor it to your needs. If you’re into stimulants this is a decent product. The Yohimbine may be a cause for some; read the side effects section in this article for more details. The best product we have tried like this is Instant Knockout. It has different ingredients and several modes of effect that do not solely rely on stimulants. It’s also the choice of many professional athletes when they have to cut down their weight for competitions. The recipe contains six ingredients, three of which are stimulants that trigger fat burning via thermogenesis (heat production in cells), and interaction with the nervous system. They are also included in this product at quite strong dosages, spread across 3 capsules which is the total daily serving. Three stimulants at these inclusion rates is Nutrex’s idea of “beyond extreme”, but it’s not to everyone’s taste. We’ll open up the capsules now. The stimulants are Caffeine, Citrus Aurantium, and Yohimbine. The first two are common enough but Yohimbine is in less products because it is not allowed to be imported into most countries due to its potential for inducing anxiety in users. Vinpocetine and Bacopa monnieri are better known as nootropic ingredients; cognitive function enhancers that improve mental function, focus, mood and so on. Zingerone is a bioactive in ginger. It can help reduce appetite and increase the thermic effect of food (i.e. the fat burning effect of food from its heat generation). As we’ve mentioned, this product is not light on stimulants. There is potential here for you to experience some related side effects as a result: Headaches, nausea, mild tremors, heart palpitations, the jitters etc. Yohimbine has been known to cause anxiety in some people who use it, especially those who suffer from problems with anxiety already. Some people should avoid using products like this until they have checked with their doctor, such as people taking prescription medication and those with a medical condition. Pregnant and breastfeeding women should not use Lipo 6 Black Hers. Is Nutrex Lipo 6 Black Hers Recommended? For serious stimulant lovers, this will give a decent kick. Unfortunately, if you have coffee or a pre-workout containing other stimulants you might be in for a rough ride. What’s more, if you consume stimulants/caffeine habitually, you won’t be sensitive enough to them to get any fat burning effects. It even has some sensory effect which is more than a lot of products can do for you. 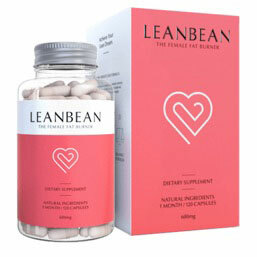 However, if you want a more rounded product that attacks fat using multiple mechanisms we would recommend LeanBean, currently the best product available to people looking for a more intense and female targeted weight loss product.